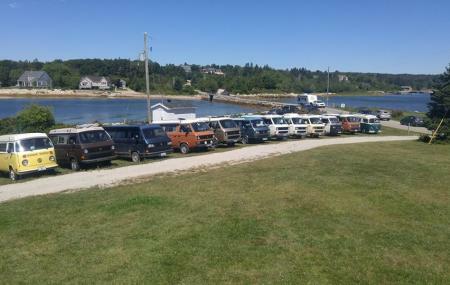 Find hotel near Graves Island Provincial ..
Overlooking the mesmerizing Mahone Bay waterfront, the Graves Island Provincial Park is a popular camping spot for both the local Nova Scotian people as well as the tourists who seek some quite time far from the din and bustle of the town. From kayaking, canoeing, paddling to biking, hiking, swimming and picnicking, the Graves Island Provincial Park is perfect for enjoying outdoor adventures. You will have to pass through an electronic gate after paying the entry fee (which is refundable when you are returning) to enter the campsite. The park has 95 pristine campsites, of which 33 sites have both water and electricity; it is joined by the narrow causeway with the mainland. If you wish to stay in more remote area, then there is also the tenting spot located near the woods laden with wildflowers. Small island with enough facilities to enjoy your time. Graves Island Provincial Park is a wonderful park where you can camp, hike or swim. The trail of a little more than three kilometers all around the island is particularly interesting and offers some information about this place. The landscapes are very beautiful. This place makes you feel peaceful. Beautiful island. Nice big camp sites. The water isn't drinkable unless you boil it first. There's a trail around the outside of the island, around 3.5 km long which is lovely in the early morning or evening. One of our favourite provincial parks at which to camp. We have stayed here several times over the past 20 years, which is a lot since we live in Waterloo Ontario. There are at least 20% of the sites with water views, and many have reasonable privacy. The best sites have no services but there are several with great views that have 2 services. The comfort station is a bit poor with only 2 showers for the whole campground, per gender, and we never visit in peak season so it might be crowded. Good provincial park in a quaint location. Short driving distance from Halifax and Lunenburg. Few amenities available nearby, so be prepared and don't expect to be able to get much near the park or at the park. Wood is the normal overcharge fee of 5$ of a tiny bundle.